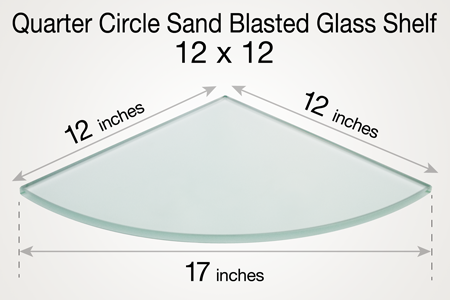 This 12 x 12 inch Sand Blasted Quarter Circle Glass Shelf is an excellent home shelving option. The glass is tempered for your safety and is made of sand-blasted glass, both distinctive and uniformly smooth, providing a satin-like appearance. The edges are flat polished for a high shine, and are beautifully fabricated. 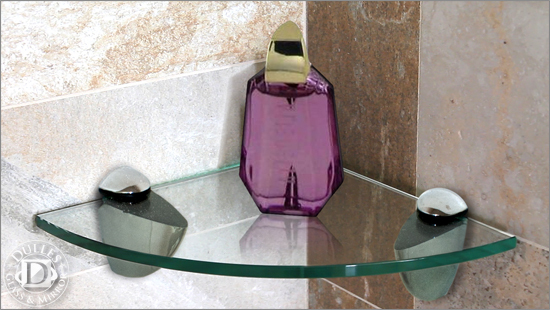 This sophisticated glass shelf is also perfect in multiples; stack more than one glass shelf in the same corner area to showcase many small treasures at a time! Size: 12 x 12 Inches. Thickness: Glass shelf is 3/8” thick (10MM). Safety Features: Tempered. Edgework: Flat Polish Edge. Glass Type: Sand Blasted. Shape: ¼ Circle. Ships: Via UPS.